What a good bit of music writing has is an overabundance of taking itself too seriously. I am guilty of it. 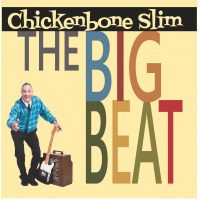 There would have been a time when I would have dismissed a recording like Chickenbone Slim's The Big Beat as a silly contrived blues confection and I would have done so at an artistic loss to me. Twenty-five years of writing has taught me to listen to everything and appreciate it all for what it is. What The Big Beat is, is a loping juggernaut of electric blues, created and propelled by San Diego's own Larry Teves, AKA, Chickenbone Slim and his sveltly raunchy Fender Telecaster. Preforming as a nominal trio act, Slim plays a brand of blues, funk and R&B that is universal, whether it is the stop-time swing of the title piece, the soulful "Long Way Down," or the dangerously acoustic Bakersfield "Vodka and Vicodin." But it is not all blues, no, "Hemi Dodge" is some grand country music, where Slim plays some power twang guitar. But the devil here is in the blues as those found in Jon Atkinson's Little Walter/Big Walter harmonica playing behind the molten "Long Legged Sweet Thing" or the stomping "Do You Like It?" Track Listing: The Big Beat; Long Way Down; Hemi dodge; Vodka and Vicodin; Long Legged Sweet Thing; do You Like It? ; Me and Johnny Lee; Man Down; Break Me Off a Piece. Personnel: Chickenbone Slim (Larry Teves): guitar and vocals; Kid Anderson: guitar; Jon Atkinson: guitar, bass, harmonica; Scot Smart: bass, guitar; Marty Dodson: drums.